I’m glad we agree on the importance of that period. London Greenpeace, the small campaigning group founded long before their environmental namesake, was brought to trial for leafleting about McDonald’s practices. I wrote about the McLibel case in my book Secret Manoeuvres. The McSpy chapter includes some serious questions about the cooperation between the private spies hired by McDonald’s to infiltrate London Greenpeace and Special Branch, more specifically the Animal Rights National Index, ARNI. The head of security at the fast food giant at the time was himself a former police officer who happily used the network of his old colleagues to exchange information on protesters. I brought up some questions about possible further cooperation, with ARNI using the corporate infiltration as a stepping-stone to target animal rights activists. I was not far off the mark. Late in 2011, members of London Greenpeace exposed Bob Lambert as a spy. After a 26-year career with the police, he had become known as a progressive academic opposing Islamophobia. Lambert publicly acknowledged that he had infiltrated London Greenpeace in the mid-1980s, going by the name of Bob Robinson. He also confessed to having tricked two women into intimate relations. He fathered a child with one of them and disappeared soon after. He apologised for his covert activities, but claimed that in order to infiltrate the Animal Liberation Front ‘forming false friendships was necessary to build a credible cover as a committed activist’. Lambert talked in great detail about his involvement with two animal rights activists specifically – Geoff Sheppard and Andrew Clarke – and claimed they could not have been arrested without his intelligence. The two spent several years in prison for setting fire to three Debenhams stores in a protest against them selling animal fur garments. Sheppard and Clarke were tried and found guilty, but the culprit who planted the incendiary device in the Harrow store was never caught. Bob Lambert’s exposure as an undercover police officer has prompted Geoff Sheppard to speak out about the Harrow attack. He alleges that Lambert was the one who planted the third device and that he was involved in the ALF’s co-ordinated campaign. If this would indeed be true, it would constitute a case in which ‘a police officer crossed the line into acting as an agent provocateur’, Lucas stated, calling for a public inquiry into the use of police spies. So I agree the early days of Bob Lambert’s career do need to be investigated, sooner rather than later. What you need are the stories of the people directly involved, the activists Lambert’s alias Robinson spied upon. Lambert moved on to supervise a new generation of police officers infiltrating campaigning groups such as Reclaim the Streets and the WOMBLES. Some of them also engaged in intimate relationships with women. There is a lot of evidence to collect. Lambert set an example, or so it seemed. More questions need to be answered. Lambert has been accused of being an agent provocateur; he might be guilty of criminal offences. Have other undercover officers crossed that line as well? And how many other police spies have been encouraging protesters to commit crimes? Everything I know about the infiltration of London Greenpeace is in my book Secret Manoeuvres. And much of what I have on corporate and police spying on activists comes from the people who were targeted by infiltrators. These people feel betrayed, on every possible level: politically and personally. It took them time to overcome the trauma, and to stand up for their rights – to get the truth out. Some of them have already filed claims against the police, others will soon follow. 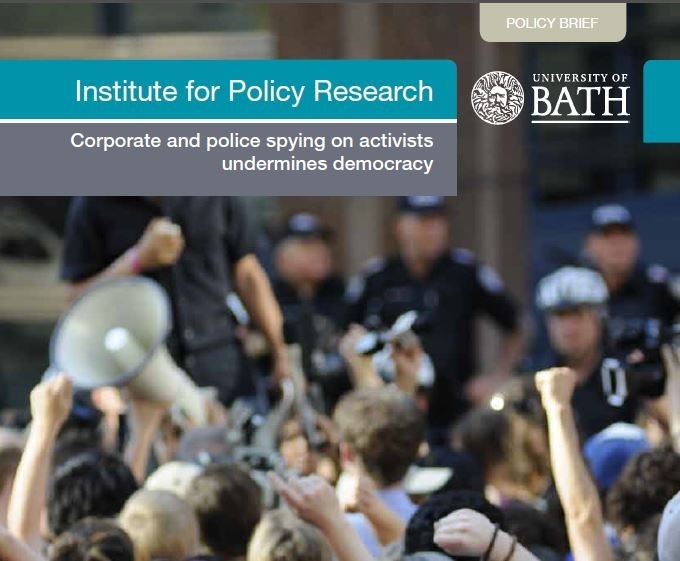 It has taken me years to gain trust, to talk to people involved and to understand the extent of the cooperation between the police and corporate spooks. I want to get their stories into the public domain. Secret Manoeuvres ends with a plea for more transparency, arguing that the culture of secrecy is dangerous. Undermining campaigners is essentially undermining democracy. For that reason, just sharing my knowledge with the police is not an option. None of the many on-going reviews into the police infiltrating campaign groups is a proper public investigation. Almost all of them are internal: the findings remain secret. The only review that has been published so far, a year ago now, was that of Her Majesty’s Royal Constabulary (HMRC) into the supervision of Mark Kennedy. The report was utterly disappointing, as I wrote here: HMIC’s ‘empty’ review leaves little hope for robust scrutiny of undercover cops. 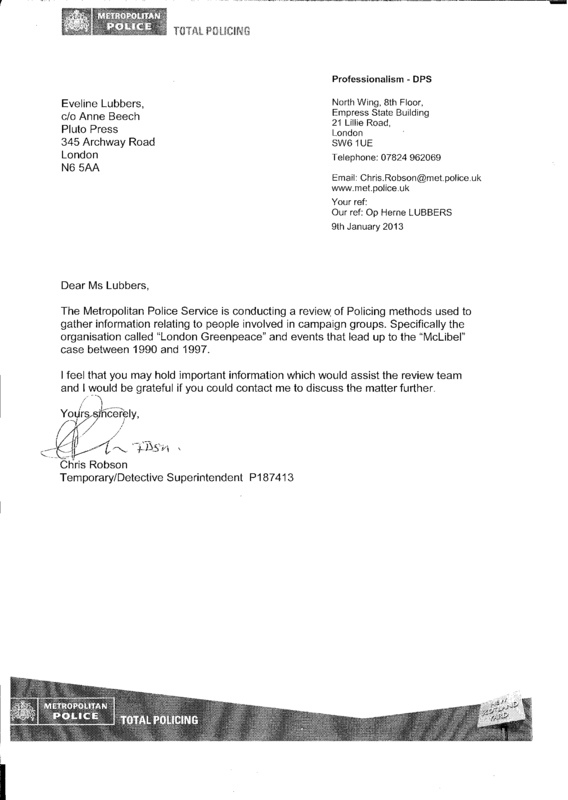 So, Chris Robson, to answer your question, it’s a no to a police review that is not going to see the light of day. I do, however, see the need for and the urgency of an investigation into the infiltration of London Greenpeace and the career of Bob Lambert in undercover operations. I would indeed also add corporate spying on activists and possible joint operations. Since both Lambert’s unit the Special Demonstration Squad (SDS), and Special Branch’s Animal Rights National Index (ARNI) have since been reorganised and replaced by special units under ACPO (deploying Mark Kennedy and other spies), I think mapping out the activities of Bob Lambert will get us to the root of the problem. In the past year, I have taken the first steps to get such an investigation off the ground, reaching out to others engaged in mapping the activities of the various infiltrators exposed in recent years. Our findings – once sufficiently verified – will be published on a dedicated website, available for all – just like we did for Mark Kennedy. We could explore, however, the idea of adding the findings from the Met’s review to the on line database. An investigation as difficult as the current one can only gain from an exchange of knowledge. Moreover, an open model might inspire other members of the public to share their information as well. A joint effort could serve as a unique trial for a proper public review, bringing us nearer to the truth. Discussing police spies and state-sponsored abuse, Jenny Jones called upon the mayor of London to act in order to restore trust in the police. ‘If justice is to be done and seen to be done then it cannot happen behind closed doors’ she wrote in the Guardian earlier this week. Supporting independent research would be a good way for the mayor to prove that he – too – is done with the secrecy surrounding spying on activists.